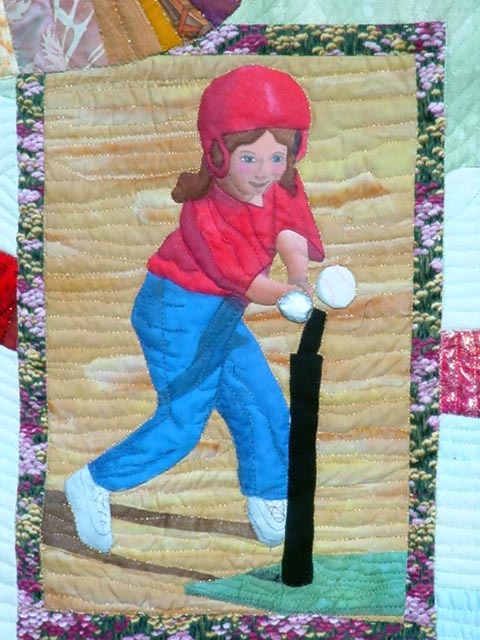 It's a funny thing about making commission quilts: Once you make them, you don't get to have them any more. They are gone. Fancy that! This little fact never occurred to me at first, and when I realized that they were going to be gone for all time, I starting making two quilts at once, as you can see in the photo at the right. I simply cut two pieces from each template, pin them up one after the other, and get to keep one of the quilts. 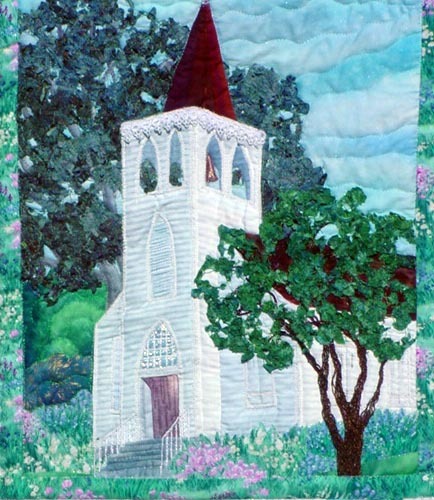 After all, the main reason I make quilts is because I WANT them! 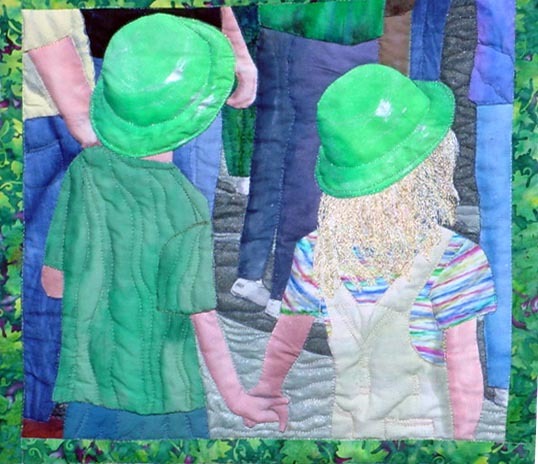 Three weeks before St. Patrick's Day, I received an e-mail asking me to create a quilt for Dublin's Sister City of Bray Ireland, to be delivered to the contingent from Bray at the Green and White Gala dinner, on St. Patrick's Day. 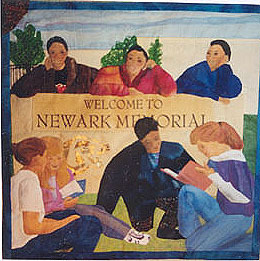 I asked what they wanted the quilt to be of, and how big, and they said: Something historic, with the City's new label. After some discussion, we suggested a scene of the old Kolb Farmhouse and the logo. 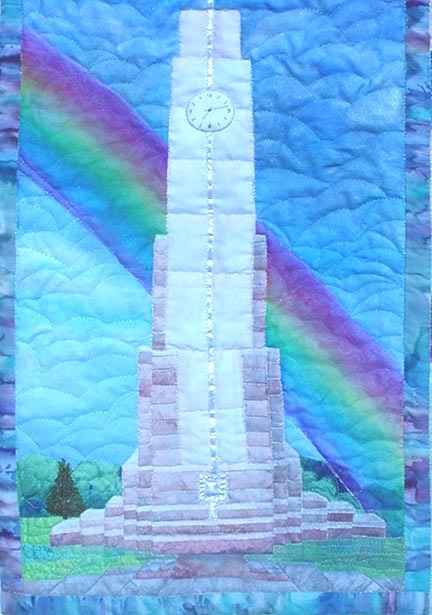 After a couple of days, I received word that No, the Mayor wanted it more like the quilt I had already made for the City of Dublin, with the Civic Center, the Clock Tower, and the Library, as well as the logo, and they wanted it 36" square, please. I still don't know quite how I did it - I finished it two days before the deadline. Good thing I retired from 26 years of working for the City at the end of December 2016! So, in case you're ever in Bray, this piece is theoretically in their Museum. Happy travels! 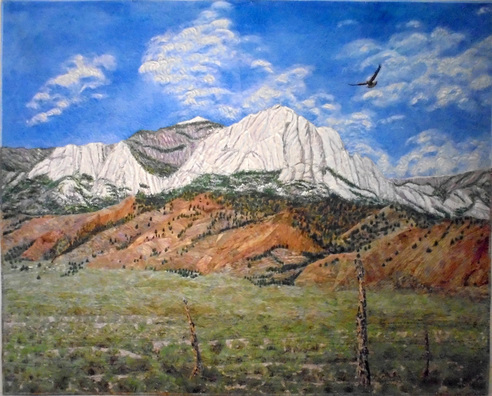 This commission quilt was based on a photo by Mary Maguire of the Toiyabe Mountain Range in Nevada, USA. 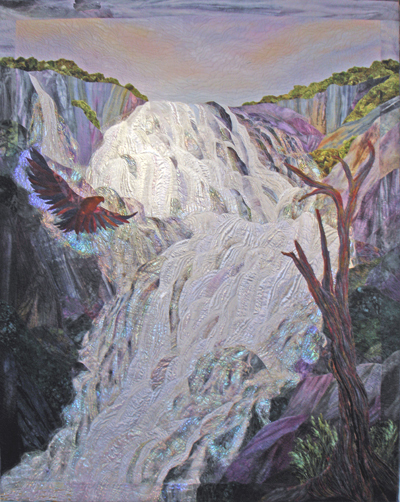 I painted the sky,and the golden eagle, painted the mountains with Puff Paint, then fabric paints and markers, appliqued the foothills and the desert, and made the sagebrush of fusible interfacing and Lutradur, painted, with fusible webbing on the back. 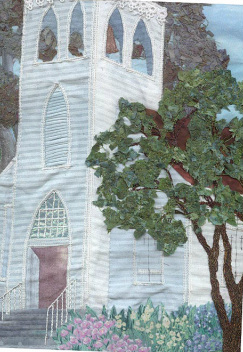 The fenceposts were painted using Puff Paint and appliqued with invisible thread; the barbed wire is an altered sewing machine embroidery stitch. 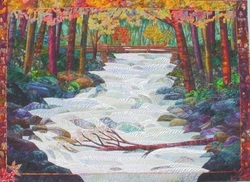 It is 66"w x 52"t and quilted using my home domestic sewing machine. Councilmember of the City of Dublin City Council. She and her husband loved to go to Hawaii, and her husband habitually wore Hawaiian shirts. 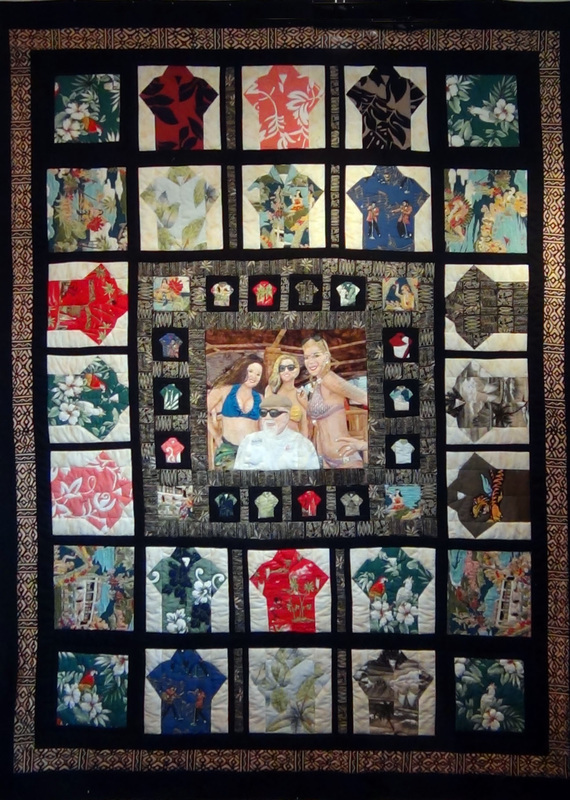 In his memory, she commissioned me to make this quilt, with the central scene of her husband in a Hawaiian bar surrounded by girls in bikinis (Claudia bribed them with drinks to pose by him! 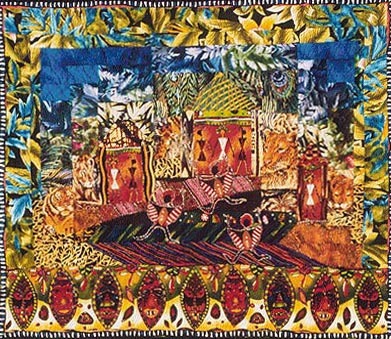 ), and patchwork and shirts made from his Hawaiian shirt collection. 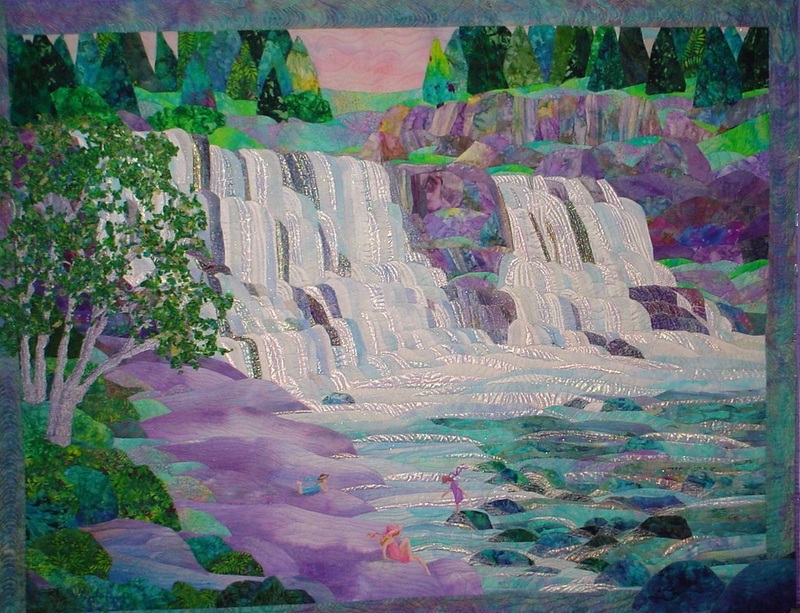 Fantasy Falls - This was my first large commission quilt, called Fantasy Falls or The Cliffs of Insanity (my favorite title). 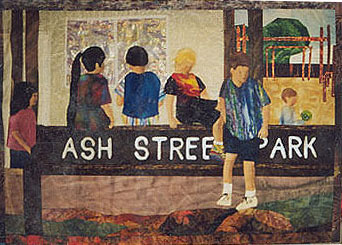 It was commissioned by a rest home in Tacoma, Washington, called The Villages. I was asked to create a piece that would hang from the third floor to the second floor, and given samples of the carpet, paint, upholstery, and wood, and had to come up with a design, which was approved. This is not based on a photograph, I just drew it out on freezer paper freehand. 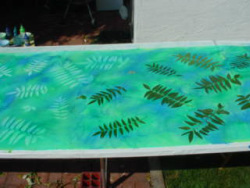 To make the back, I painted Prepared for Dyeing (PFD) fabric with blues and green transparent Setacolor fabric paints, then ripped leaves off the trees in my back yard to make sunprints. This is the back of the quilt, one ginormous Hawaiian shirt (the quilt is twin bed size), surrounded by black and a crazy quilt of the remnants of the shirts left after creating the front. The finished piece is 71"w x 81" tall, and is displayed on a daybed at Claudia's house. P.S. I also took all of the buttons off of the shirts and made them into a bracelet for her. I also had to fireproof it before they could hang it, which was a very interesting process. My husband rigged up a pole that we could put the quilt on under the eaves of my backyard studio. If we raised it all the way up, it was just tall enough so the whole quilt could be suspended. Then I got up on a ladder with a squirt gun of the fireproofing stuff and squirted the front and back of the piece. Then, I had to cut a piece of the exxtra part that I cut away from the quilt and send it to the fire department in Tacoma, which tested the sample to make sure it would not burn, before they could hang the quilt. The people at The Villages are very nice. If you ask them, they'll let you go upstairs to see this piece, assuming it is still there. 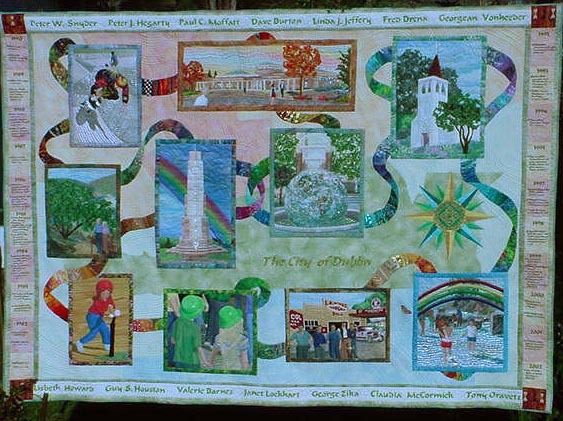 The City of Dublin Quilt, created in the year 2002 to celebrate the City's 20th birthday. The names of all of the Council people and Mayors are on the top and bottom borders, while the City's major accomplishments are listed on the left and right. 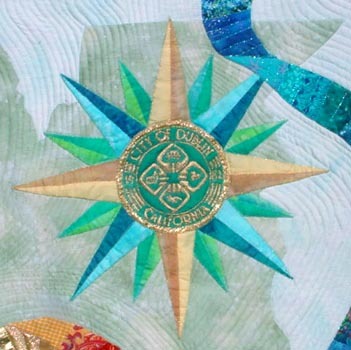 The background is a map of Dublin, and Dublin's logo is in the center of the Mariner's compass on the right. As I said, I made two of the Cascade quilts at once. The one for the actual commission was 12 feet tall; the one for myself, I split into two pieces; one 4 feet tall for above the piano, and one 8 feet tall for beside the piano. The 12 foot tall piece was designed to go on a 40 foot chimney at The Pines upscale rehabilitation center in Provo, Utah. The contractor sent me samples of the wood, the stone, the paint and upholstery, and photos of the surrounding area, and this is what I came up with. The original photo I used as inspiration is this creek. You may have seen it if you have ever walked to the top of Half Dome, as I have (TWICE!). 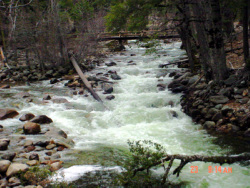 This is the creek that is on the way to Vernal Falls and the Mist Trail. "Mist," by the way, is a misnomer in the springtime. If you climb up to the top of the Mist Trail, you need to wear a plastic garbage bag over your clothes, and you will still be drenched to the skin. It's like climbing up a waterfall with the shower on, full, on cold. This is not a climb for the faint of heart. 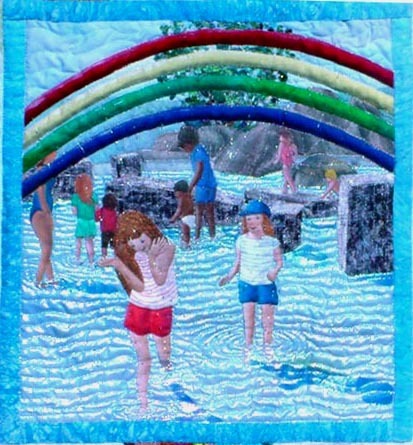 This quilt is the first quilt I had to negotiate with a City Council to do. It was a little dicey, because once it was done, it had to be accepted by the City Council before they would pay me for the work; luckily, I work for a City and know how the system works, and just forged ahead. 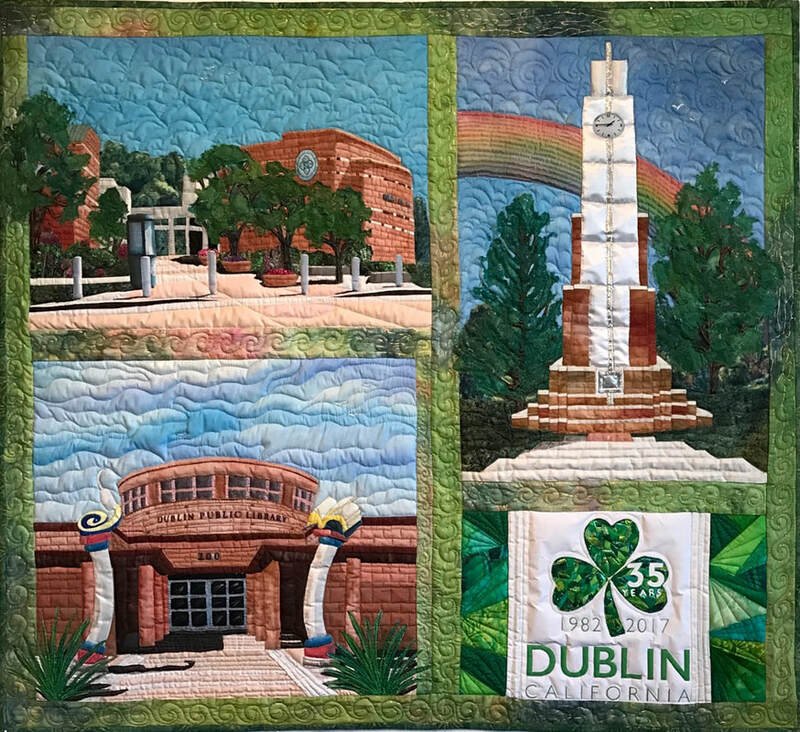 I made this quilt before the City of Dublin quilt, but it seemed to work. with this photo of them kissing under the bouganvillia, along with the beach in front of the place enlivened by the presence of the baby sea turtles that were let loose on the beach while they were there. Here are the baby sea turtles - not really cute, but she wanted them in the picture, anyway. This is the quilt I made by putting all of the elements together in fabric. 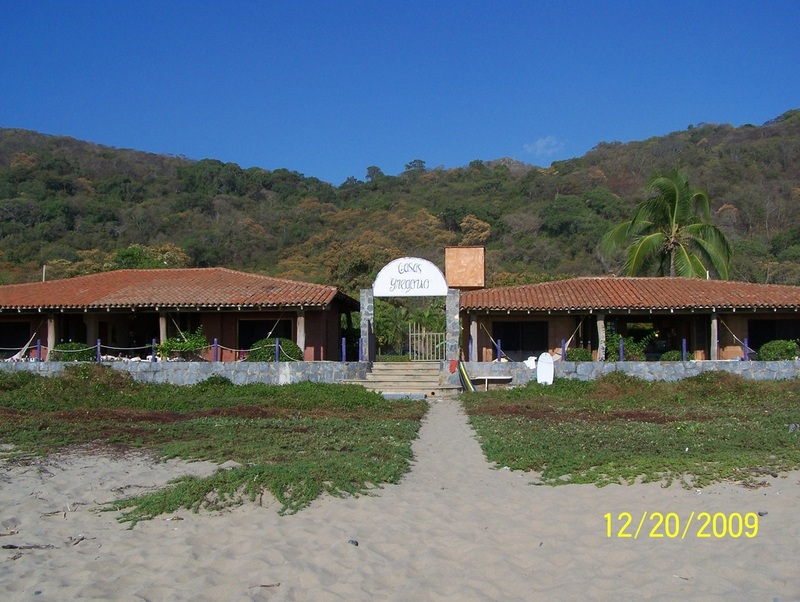 I painted the sky, made the roof with Puff Paint, the bushes out of dryer sheets, and the beach has real sand and painted turtles on it. Here is my husband's Aunt Marty on her wedding day, commissioned by her husband, Richard Schmidt. This is not, actually, quite true to the photo I was given; it has been altered because I have an Artist License and I'm over 50 and I can do what I want. I added a bit more garden, some flowers at the front, and the flower on her lapel is actually a silk flower, appliqued on. This is the original photo, and Pat's Uncle Richard wanted me to do this in a six foot tall quilt. Yes, really. That would have been terrible, for as soon as you try to quilt a quilt of a person's face that is that large, it starts to look all wrinkly and horrible, and Marty is not anything like that. My niece, Carol, sent me the original suit Marty was married in, so I could get the true color of it. The most important thing to me was to get Marty's smile - the smile of a woman who is totally happy and full of life. Sadly, Richard Schmidt is no more, we dwell in sorrow at his passing. This was comissioned by my son, Justin, for his birthday present. He wanted to give it to a new church starting up in Las Vegas. In Revelations, Jesus is garbed in white, with a sword of truth through his mouth, with seven gold lampstands around his feet, seven silver stars in his hand, saying: "Do not be afraid. I am the Alpha and the Omega and the One who lives. Once I was dead, but now I live - forever and ever." Now, my first question about this was what a golden lamp stand looked like, then how I could make a piece about Jesus with his feet glowing and a sword through his mouth without looking like a complete idiot. Justin said it was okay, because his friend had a tattoo of it which, of course, I never saw. 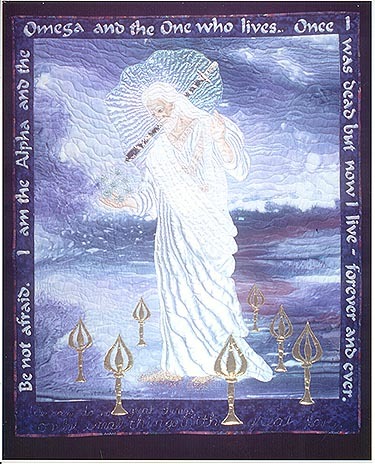 For the full story of this quilt, see The Birthday Quilt under the Essays tab. 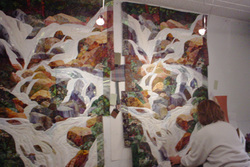 This was done for The Pines upscale rehab center in Provo, Utah. They sent me the fabrics of the upholstery, the paint colors, and photos of the area, and asked me to come up with a plan for a piece for their dining room. Apparently, they were happy with this result, and I made two at once so I could keep one, so I was happy, too. This is about 20 feet from where my son and his wife were married. This is the photo I used as my guide. It was taken in May, when the colors were pretty drab and boring. Since the dining room where the piece was to go had red wallpaper and mahogany furniture, I changed the colors to match the decor. If you don't use it, what's an Artistic License for, after all? 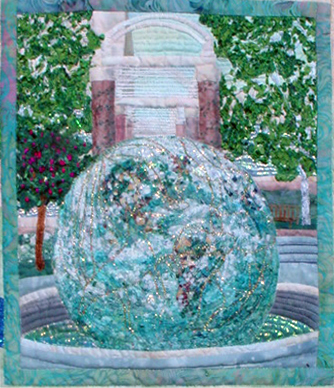 This is a closeup of the quilt I made for the City of Bray, Ireland. The City of Dublin's Sister City is Bray, so the City of Dublin hired me to make a piece of a landmark in Dublin, called Old St. Raymond's Church. 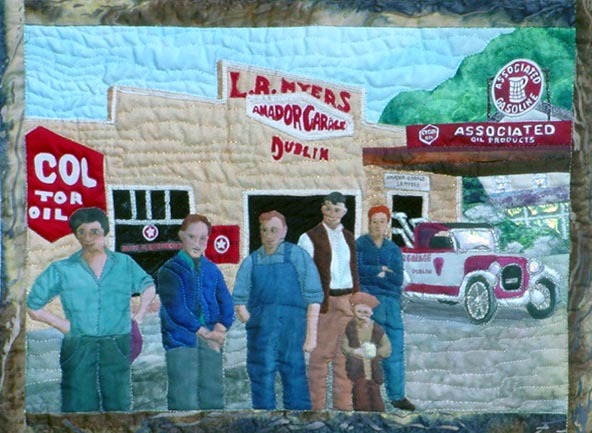 I really do think it helps that I am an employee at the City of Dublin, and that I am the only quilter they know. I made four of these quilts, of various sizes. I made one large, two small, then one that was about 3/4 size of the original. 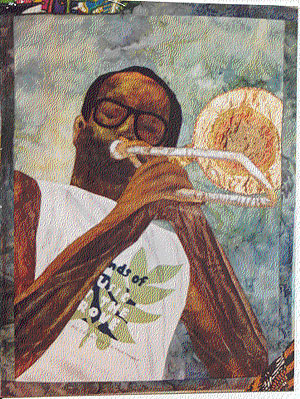 My brother, John, sent me the original photo, which he gave me permission to copy in a quilt, so I made one for him, one for me, and one larger, for exhibition. Then, I was persuaded to get my Guild together to make another, 3/4 size, for my Guild's opportunity quilt. We made $6500 in a month and a half on tickets. Very cool. If you want the full story, go to the Essays Tab and click on The Opportunity Quilt. This wasn't really a commission quilt, it was a sort of an after the fact barter quilt. 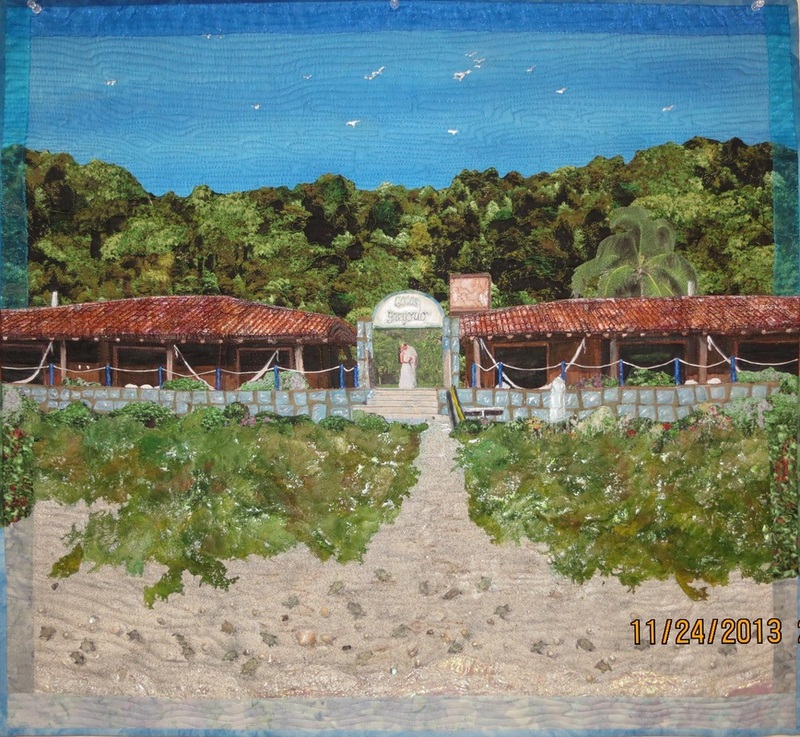 The owner of the Macchia winery gave me permission to use a photo she owned to make this quilt. I made two of them and eventually wound up trading one of the quilts for 2 cases of absolutely delicious $30/bottle Zinfandel. 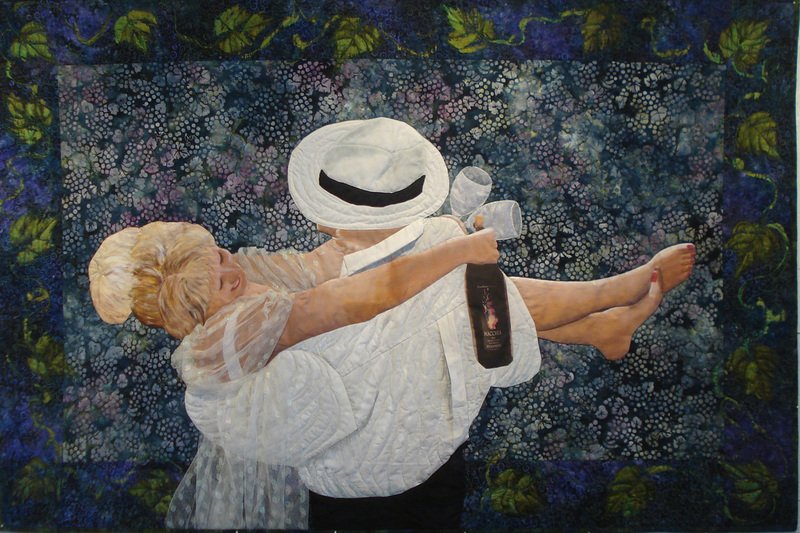 This is Laney's wedding picture made fabric, with painted figures, photoshopped bottle, and draped and painted fabrics. The leaves around the outside were printed with real grape leaves, and the name of the wine is Flirtatious. My friend at work won an Ovation guitar at the City's Christmas party. I asked her if she played guitar and she said "No, but maybe my grandchildren will want it." I shuddered, thinking this should not be the fate of any Ovation guitar. Six months later, I asked how the guitar lessons were going, and she said they weren't really interested. I said I'd make her a quilt in exchange; she said "Great! 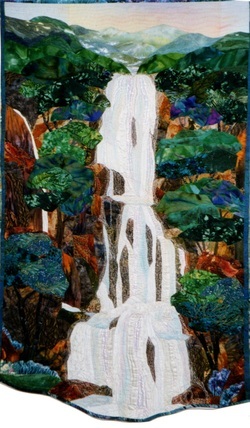 I want one of a waterfall we saw in Hawaii, and I need it to be 18"wide x 50" long." Cool. I made her the quilt and she loved it, but her husband said she had to give me money, as well, so she did, and we were both happy. I have the guitar, she has the piece, and all is well with the world. 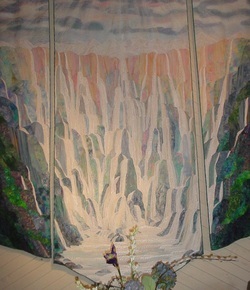 Jennifer Priestly, of Fabrics to Dye For, commissioned this piece to advertise her hand-dyed fabric. She sent me a stack of fabric and told me to do whatever I wanted. I don't quite know how this happened, but Jennifer swears that's her, sitting on those rocks at the edge of the sea (she does live in Rhode Island near the beach), but I wonder what happened to the little boy fishing in a pond in the woods I planned to make? Oh, well, she likes it, I had fun, and everybody's happy. You might have seen this in a magazine as an advertisement for her fabrics. Again, I did not make this with the intent to sell it. It just happened. I started this in a class with Sylvia Einstein, who wanted us to do some "Persian Pickle Piecing," which I still don't understand, along with architectural shapes. How mine evolved into an African tribal village complete with jubba jubba men, I don't know. All I know is, I've sold two of these already (unwillingly), and I don't have any more jubba jubba men left, so don't even think of buying mine. 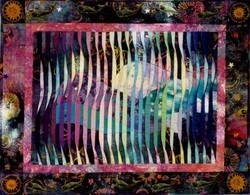 This is a piece I made in a Caryl Bryer Fallert workshop, which was subsequently sold to Alta Bates Hospital. I think it is still there today, somewhere in the back offices. This is the photo I was given to create a quilted piece for a friend of ours. It really is a lovely photograph, but, sometimes, I think photographs should just remain photographs, and not made into quilts. I'm still looking for the picture we took of this piece - I have a feeling it's on the movie camera that I don't know how to download. I'll put it up when I find it.